A stroll around this fascinating house reveals a marvellous collection of reception rooms, staircases and individually decorated bedrooms. A brace of historic terrace houses have been linked together creating exceptionally generous spaces. Guests are encouraged to walk through the kitchen and help themselves to beverages and snacks from an 'honesty bar' fridge helping them feel part of the family. 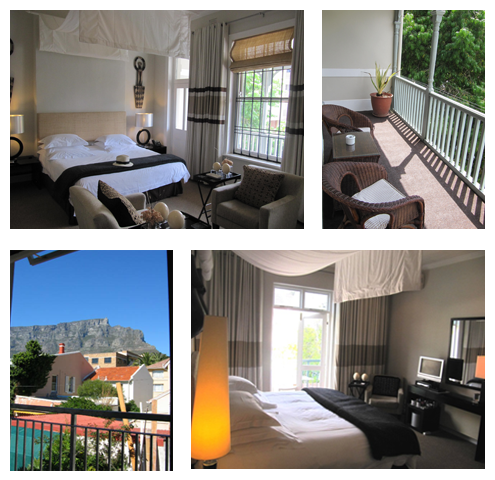 Some of these rooms have large furnished balconies overlooking a quiet suburban street, while others have step-out ('Juliette') balconies above our peaceful courtyard and have mountain views. NO single rates are offered – ROOM RATE ONLY. Courtyard-facing room with en-suite with shower OVER the bath plus toilet. King-size or Twin Single Beds are possible. 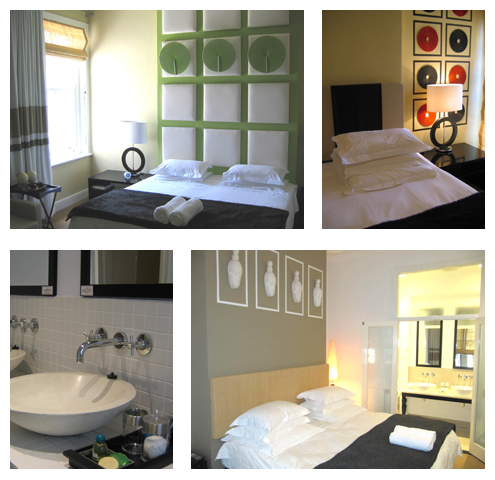 Spacious rooms (some upstairs and some downstairs ) with shower, basins and toilet en suite. 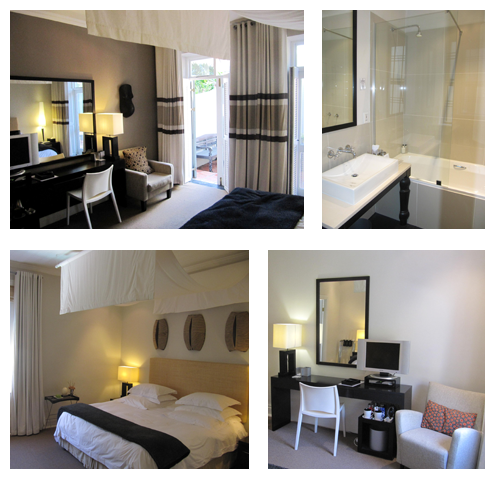 Each with its own contemporary African ambiance. King-size or Twin Single Beds are possible. Air conditioning/heating - Flat screen TV - Satellite TV (news, sports, movies) - Complimentary Wi-Fi access - Hair Dryer - Tea/coffee station with cookies - Electronic safe - Luxury cotton percale linen – wake-up calls and packed breakfast for an early start. An honesty bar fridge - complimentary cake - help yourself to port and sherry in the evenings – small library with daily news papers and book swap shelf also guest computer station for free emailing and browsing - a popular gift shop with a very carefully selected African curios - only the best!